Richmond Personal Injury Lawyers | Collier & Collier P.C. 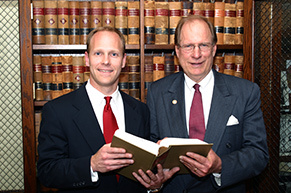 The attorneys of Collier & Collier, P.C. are known in Richmond and throughout the Commonwealth of Virginia for their quality legal representation in personal injury cases. If you need the services of an experienced personal injury lawyer, contact our firm at 804-364-5200. Richmond Personal Injury Attorneys. Leave the Legal Issues to Us. We know how frustrating this time is for you. No one plans to get injured. You’ve been hurt due to someone else’s negligence, and now you have to deal with the stressful and time consuming legal issues surrounding your injury case. Put over 70 years of combined legal experience on your side. Call Collier & Collier now, and leave the legal concerns to us. While you focus on feeling better, we’ll work to get you every penny you deserve. We have the background, resources, and experience necessary to win your case. At Collier & Collier, we focus our practice on a wide range of personal injury cases, including cases that involve automobile accidents, such as car accidents, truck accidents, boat accidents or motorcycle accidents. We also provide passionate advocacy for clients injured due to medical malpractice and for family members affected by wrongful death. Further, we assist with cases involving nursing home abuse, product liability, and dog bites. Contact Collier & Collier, P.C. for a Free Initial Consultation. Our Martindale-Hubbell AV-rated lawyers will fight hard to see you obtain justice in your personal injury case. In most cases there is no charge for an initial consultation to determine if you have a case. If we agree to work together, our fees are contingent on your recovery. If you are the victim of an accident, call the personal injury lawyers of Collier and Collier, P.C. at 804-364-5200 for a free consultation. We service clients in Richmond and the surrounding areas. Home and hospital visits are available.